It has been announced that BMW has released Sebastian Vettel and he will be racing for Toro Rosso alongside Vitantonio Liuzzi for the rest of the season. So, contrary to my hopes, Scott Speed is out and F1 no longer has an American driver nor a USGP. That will please the American F1 fans no end, I'm sure. As yet, Scott has made no comment and it remains to be seen whether he wanted to stay with the team or not. I suspect that he'd had enough anyway. But it does mean that my readers will no longer be subjected to the occasional Scott Speed post - unless he goes to Champ Cars or something similar and does really well, of course. I must admit that Vettel stands a chance of survival at STR; he is fast, there's no doubt about that, and eager to succeed. But the challenge facing him is no minor one. He is going into a team that has been riven by bad feeling and where the managers have done little to support their drivers. And he will be expected to be quicker than Liuzzi right from the start, a task that may not be as easy as everyone seems to think, especially as Tonio has experience both of the car and F1. So it is a big hill for the young German to climb and, if he succeeds in doing so, he will have proved himself worthy of a drive in a better team. But I am not so sure that the STR move is a good one for him. With BMW he was with a team that is going places, an efficient, well-run outfit with ambition and the muscle to make things happen. He did his reputation wonders by his showing at Indy, where he filled in for Kubica and scored a championship point, and he was going to get a drive next year whatever happened. The move to STR may have come a little early and could do a lot of damage to his future prospects. So it is a gamble but I suppose one that any young driver would take; they are all desperate to get into F1 and sometimes make poor decisions as a result. I think Vettel has enormous potential and I hope that the gamble pays off. All he has to do is beat Liuzzi. 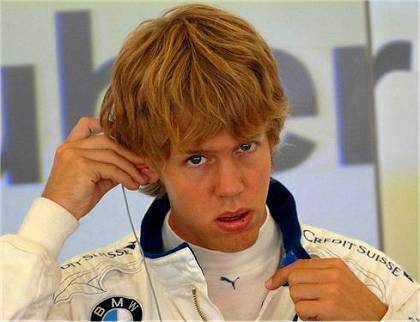 of course, vettel could potentially still make a return to BMW in the future. this could be a temporary move. Truly unfortunate....... Although I think we're are the only ones that feel this way. Also I question if Vettel and Bourdais are as good as everyone thinks. Vettel did score a point, but he did it in a car that should have finished in the top 6 (considering Nick DNF'ed). Bourdais' ability is a little harder to judge, Champ Car runs mostly on road courses that seem to reward consistent safe laps and the ability to save fuel. Not to mention that his team has dominated the sport and most likely will continue after his move to F1. It is also worth mentioning that he hasn't dominated this year, in fact he has had problems with some up and coming rookies. Not very impressive considering how watered down Champ Car talent has become. Just wanted to mention that Montoya finished second at Indy this weekend. I think hes a great fit for Nascar and his attitude has been great. Maybe will see Speed be the next high profile star coming to the sport. Every driver that isn't from the deep south helps with the stereotype Nascar has been burdened with. It would probably hurt his reputation in the eye of the European, but its time he came home! True, Dan, now we will get to see just how good Vettel really is. He has chosen probably the hardest way there is to make his mark and I hope he manages it - always thought the guy has great potential. As for Speed, I hope he does return to the States and get a decent drive in Champ Cars or NASCAR. Plenty of people even in Europe are watching Montoya's progress and it will be interesting to see whether Scott can blow everyone away in American racing. That's a good point about NASCAR getting away from its good-ole-boys image too - what better way to do it than have a few ex-F1 drivers in there punching? If your not cheating your not trying. If your not fighting, go to open wheel! Ill see if I can locate the interview. I'll say this for NASCAR, they've accepted Montoya into the fold very quickly and easily. Gave him the odd shove to begin with but now he's one of them. And Scott might get the occasional ribbing as "that there surfer boy from Californ-eye-ay" but it would all be good natured, I'm sure. Yeah, let's hope he goes to NASCAR. Vettel - Another of the Macau GP "graduates" with the race seat in F1 ... Toro Rosso will likely be only the F1 warm up seat for him. If he is as talented as people say, he will not be stuck and the bottom of the grid for too long. This is what i had expected should have happened right after Scott made the comments after the last race. I have to say i'm more than a little surprised it took so long time for it to materialize. If there have been such harch doings going on in the team between a teamleader and one of his drivers, there's no way the driver is ever going to find the motivation to do his best for the team ever again. No matter what money or excuses he gets. And talking about Vettel, i believe this is the worst ever decision he could make. Yes, he is going to drive a F1-car, but that's all. He is going to drive in a team haunted by bad strategies, bad setups, bad speed in the car, horrendeous pitstops, unexplainable things happening to the car. I mean, it is not by any way Speed's or Liuzzi's fault the car has finished in just half the races it have competed in. Even Super Aguri would have been a better team to go to. Considering the means and finances that team have, they are doing an awesome job. And then, i believe that Takuma Sato must be an incredibly good person to have as teammate. I have never seen any other driver with so much energy in his work. Best of luck Scott, with what ever you do in the future. But honestly, i'm not going to miss you in F1. All very good points, Björn, except that there is a faint possibility that you haven't seen the last of Scott Speed yet. This morning there are reports that Scott's contract hasn't been cancelled and that more will be announced after the Hungarian GP. That leads to speculation that STR might boot out Liuzzi and put Speed in his seat - sounds very unlikely to me but, where the STR managers are concerned, it seems that just about anything can happen. The whole thing is becoming as intricate a drama as the Ferrari documents furore and I am left shrugging my shoulders and saying, "Let's wait and see." What you say about Takuma Sato is spot on. The guy is really good value for money, enthusiastic as hell, very quick and the nicest guy in F1 by all accounts. And you're right about Super Aguri - from being the paddock joke of last year they have progressed to become a model of how a small team should be run. Vettel must be at STR for Hungary - it's too late to change the race entry list. In fact, I don't think Scott will be returning to STR, because STR's behaviour towards him has been so disgusting - a literal slap on the back (in the Nurburgring paddock) followed by a metaphorical slap in the face (STR say Speed's in without asking him, then say he's out without asking him) is not the way to win friends and influence people. Especially when they're as plain-thinking and plain-spoken as Scott Speed. Best wishes to Scott, whatever happens next and wherever he eventually races. I don't think Vettel stands a chance at STR. Not only is the political situation likely to prevent him from deploying the full extent of his talent, but he is also contracted to Red Bull from 2009, and I think BMW's release of Vettel signals that no vacancies in BMW for 2008 are foreseen. Vettel could be stuck in a dead-end seat for a loooong time - or thrown out with the bathwater - unless either Coulthard or Webber retires to leave a Red Bull (dare I say proper team) vacancy. All true, Alianora (as usual! ), although I am hoping that Vettel is so good that he shines even in an STR. It would put Scott more into perspective, it's true, but it would also be a terrible shame for such a bright young prospect as Vettel appears to be to have his chances snuffed out so early.